Finally back at home after 10 days of serious “Jet Setting”. Started last Thursday with a trip to Reno for the annual Tailhook Symposium and Reunion. That whirlwind trip included a trip up to Lake Tahoe, a Winery Tour, a 4 hour Mixer with 3,000 of my closest flight suit clad friends, an awards luncheon where two very close friends of mine – Hans and Kathy Schmoldt- won “Honorary Tailhookers of the Year”, various symposiums, a couple of trips to In and Out Burger, more than a couple of trips to the “At your leisure Beer Taps”, and finally a banquet with 1,800 in attendance where Senator John McCain was the Keynote. All in celebration of the 100th anniversary of Naval Aviation! Trust me… a great time was had by all! Monday I was up with the dawn patrol, wheels in the well at 0700 for my monthly visits with clients and co-workers. Non-stop from the moment I touched down until I was once again wheels in the wells headed back to the Mile High City. One break from the usual fare of client visits came in the form of a company outing to Citi-Field to take in a Mets Game! Despite being a bit of an on-again off-again rainy day we had a blast! I had not been to Citi-Field and was pleasantly impressed. Still can’t get over the air traffic passing in close proximity as they shoot the Expressway 34 approach into LaGuardia. Seriously? You think you’re as deserving of respect as the US Armed Forces? "They want to make it that guys paid this much money for a ticket, yeah, I understand that, I understand completely. We risk ourselves out there on the field each and every day also. When soldiers come home from Iraq you don't boo them. I look at it the same way. I take my job seriously,"
His statement of “We risk ourselves out there on the field each and every day also…” is completely asinine! Really? … REALLY! I would love for this Narcissistic, prima donna to actually serve on the front lines in the mountains of Afghanistan for a football season! And make the same $1,547.70 a Marine E-3 get’s paid per MONTH!!!! To “Risk Himself”. You naïve sonofabitch! We don’t ‘Boo’ our returning Soldiers, Airmen, Sailors, and Marines because they serve a cause greater than themselves! They do it 24 hours a day, 7 days a week, for a minimum of 4 years! They are selfless defenders of our FREEDOM!!! YOUR FREEDOM A-HOLE! It is thanks to these men and women on the line that you have the opportunity to make in 2.4 minutes of playing a GAME!!! what these individuals make in a YEAR!!! How many times were you shot at in those 2.4 minutes? How many IEDs did you have to look out for? How many of your fellow teammates were killed in action? You bumptious attention whore! SDASTFU! I hope New Yorkers recognize you for the pondscum you really are and continue to “boo” you for the rest of your hopefully short career! My mini-vacation is now in the history books, stuffed with fond memories. 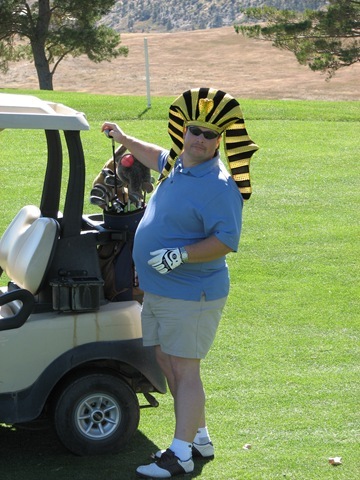 But alas I would be remiss without a few more photos from this past week’s golf outings. Today I present you with a few select images from our round at Arrowhead. Arrowhead is one of my favorite courses, it is a challenging course, especially if you are unable to put a ball in the fairway, the native grass is a ball swallowing monster… wanna get rid of a new box of balls? Play Arrowhead! But the cost of the balls is to be considered part of the price of admission into one of the most picturesque courses in the nation. By the way… as for the “price of admission” Arrowhead has a pretty interesting deal going to attract golfers to this fine course. For $90.00 you can get a round of golf+cart+all meals, snacks, and non-alcoholic beverages included! All you can eat! That includes in the clubhouse restaurant and from the ‘bar cart’. What’s with that awful fashion statement on Stu’s head you ask?… Well I’m glad you ask. You may remember from a previous post (years ago) Tim and I started a bit of a tradition. In a modified skins format, whoever loses the hole is required to wear “The Hat”. 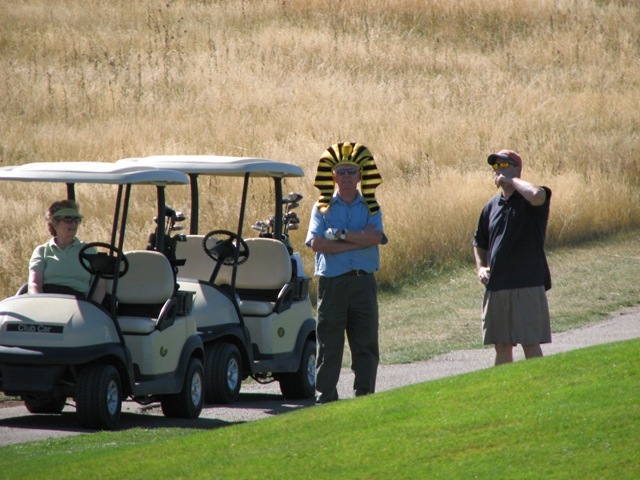 Initially it was an extremely effeminate Pink Hat… that later became an extremely obnoxious ‘King tut’ headgear…[1,2] and this year returned a bit to it’s roots of a more basic, if not gaudy dome cover! The image below is of Stu meditating a bit (in the hat) and waiting on the group in front of us to clear the green, trying to find a way to relieve himself of the modeling burden on this hole. Not a bad place to find a bit of peace and tranquility. And finally, Arrowhead provides a number of opportunities to view the local residents. And now that my lunch break is over, I return to the usual work related festivities. I hope that any break you all get this summer is as enjoyable as my past 5 days have been with great friends. Cheers! It is baseball season after all. Colorado unquestionably has some incredible scenery, and Estes Park, near Rocky Mountain National Park is some of the most majestic. 14,000 foot peaks surround! 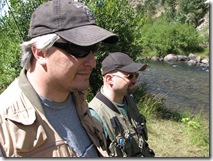 Three buddies of mine and I took this day and headed to the Big Thompson River that winds its way down from Rocky Mountain National into the great plains of the US to do some more fly fishing before the season escapes us. 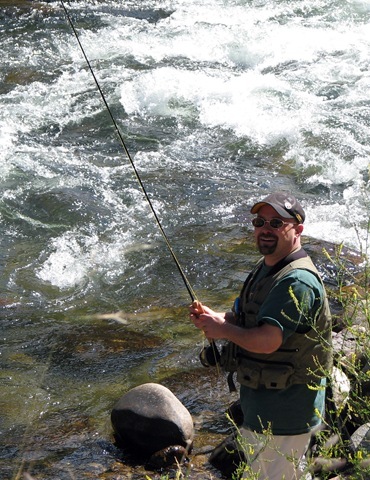 And alas Clay (below) was not to be shut out… hauling in a monster 5 inch rainbow! Hell… Clay’s cigar was bigger than the fish! And finally YHS… casting once again in hopes to not land another record setting tree, rock or weed… But then again I’m the only Manly one not wearing waders and who didn’t order a nine word cup of coffee this morning! No, not what happens when Bruce Wayne propositions a prostitute… rather a cool thing to do in the batter’s circle when warming up at a baseball game. Alas the weather held off, and at Zero-Six this morning as I headed to the course, I was greeted by a clear sky sunrise. Things are looking up. The four of us met up at Arrowhead at 7:30 for our scramble, after one of us took a slightly unauthorized tour of the Lockheed Martin facility. Being greeted by these wonderfully clear skies certainly laid the foundation to our all being in a good mood for our round. And continued throughout. We had no illusions that we would finish in any of the top places (three of the four of us are average golfers at best), but we did know we would have fun! We succeeded. It was one of those great scramble teams where each of us contributed to the team. We ended up 3 under par, which for a scramble is not great… but it certainly wasn’t bad. Like most rounds we left a few opportunities out on the course, but hell… Woulda –coulda-shoulda doesn’t really get you anywhere. I won’t bore you with the details, except these simple observations, “Baby Huey” could hit a marshmallow 300 yards! Stuie plays best when he is stiff! Newie did alright for not having touched the clubs for over a year, and putting on aerated greens is 40% luck, 40% skill and 20% more luck! 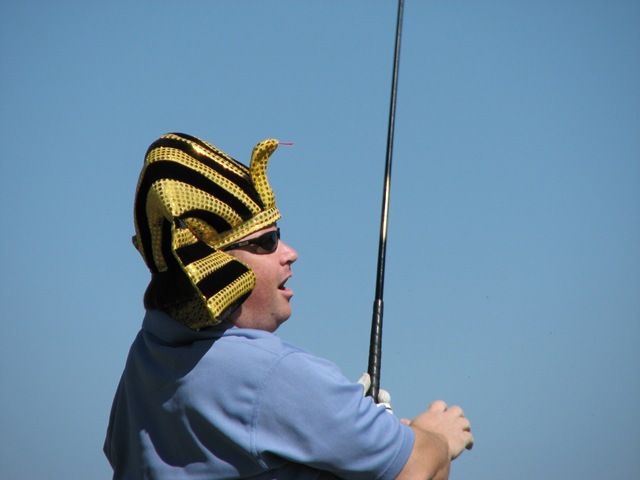 As for Your Humble Scribe… Hell, I was just glad to be there to enjoy the banter, laughter, stories and good golf! Thanks for being there boys and especially to Stu, for putting this whole thing together it was exactly what I needed on this Sunday. Couldn’t picture a better place to be today. Fun Stuff… Stellar views, Good golf, and Great friends! Ok usually I do not support “Skate-Rats”, “Bike-Rats” etc… I mean usually I take a perverse pleasure in watching a Skate-Rat try to to a ‘Double Grimy’ off a McDonalds sign and then proceed to smash the family grapes in a way that would do Darwin proud! But… This guy is quite impressive in his chosen… uh… hobby? Pastime? Sport? Hmmm I might be pulling for the Chargers this next year. 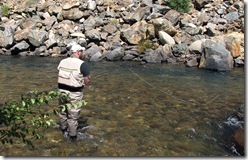 I haven't been fly fishing in... well... since forever! Today however, I decided to join 3 of my buddies and try once again my hand at this most elegant of outdoorsman activities. I've always been captivated by the subtle flow of the line to a creek, gently landing a hand tied fly in hopes an eager "rainbow" or "brownie" will be enticed by such a teasing morsel. 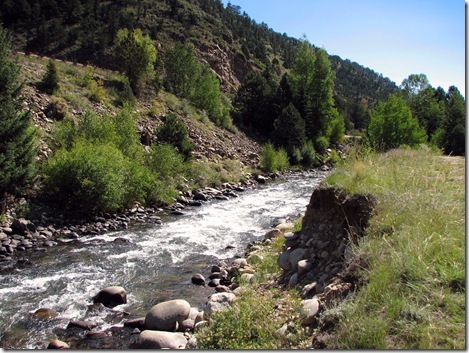 We headed up to Clear Creek just west of Idaho Springs Colorado. 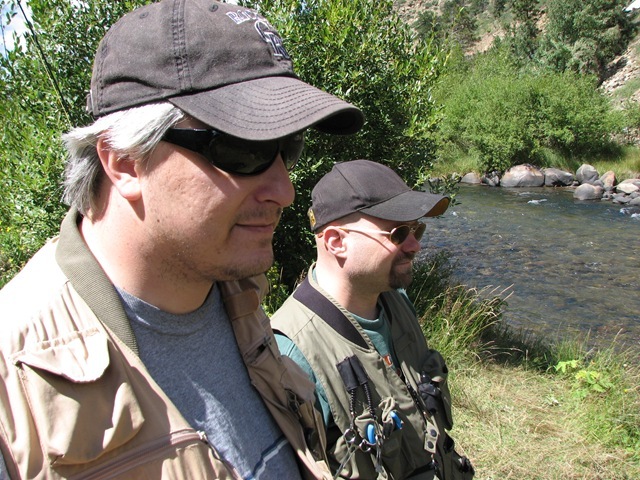 My buddy Trevor, a longtime fly fisherman, took me under his tutelage and walked me through the vocabulary, knots and steps needed to begin enjoying this great pastime. After learning the nail knot, the leader and the tippet, I attached a fly using a well known fisherman's knot and it was off to the creek with me. Trevor showed me the basics and let me have at it. And I think much to his surprise I was a bit of a natural... maybe my older age has subtled my racquetball wrist snap, which had previously been know to send multiple flies to their early dispatch! 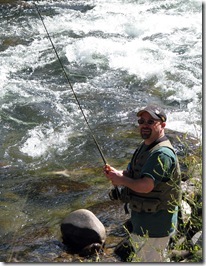 But almost instantly I was able to lay a cast within a couple of feet of my intended spot on the creek 25 feet away! It became fun! I had barely gotten to the point where I was having confidence in what I was doing when a massive boil hit my downstream floating fly! BANG! Wow! Seriously! This actually works! Unfortunately that first attempt at my fly was quickly thwarted by the wiser trout. I was unable to set the hook quick enough. But, I was not to wait long for another. 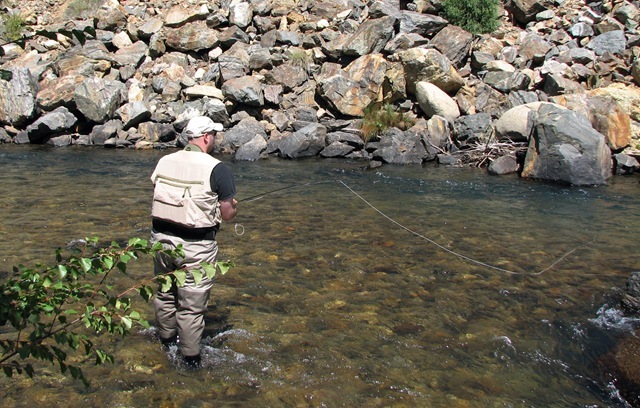 A few casts later on a drift right along a deeper channel in the creek, my fly disappeared in a cacophony of white water! This time I set the hook like the expert I hope to be! And low... put up a mighty 13 second struggle to land my first fly caught trout! The fish fought for all he was worth! But alas I was the better in this epic. I drew my rod high as instructed and kept this battling baby on the line! And whoooo what a baby it was!!!! 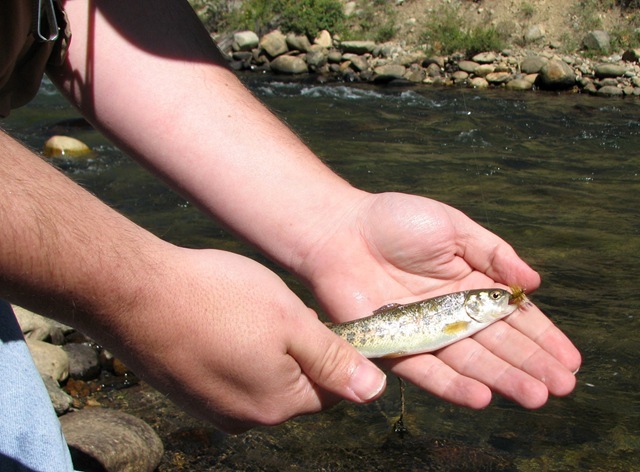 Here now, is a picture of my very first fly caught Trout! Straight from the rushing waters of Colorado's Clear Creek! Hehehe! What?... Like I had a choice in what took the fly? I think I'm gunna mount him over my... lighter? Anyway, we proceeded to catch some more about this size and then a few small ones. I caught 7 fish in about 3 hours on the creek, and the largest was a whopping 8 inches long and maybe a 1/2 a pound! But I didn't care, I caught fish (well bait anyway!) on flies! My partners in crime each caught their fair share of these small feistys, but the trophy of the day goes to Scooter for pulling a 2 and a half pounder or so out of the creek! That was a nice fish. Pardon the pun, but I think I'm hooked! It was relaxing, beautiful, and challenging all in one! What a thrill and a great way to spend a Saturday with friends!